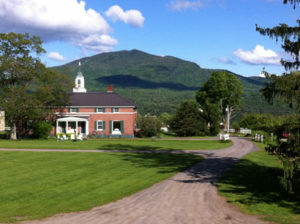 The Mountain View Farm Animal Sanctuary is located on a 440-acre historic farm estate that is also home to the Inn at Mountain View Farm, a 14-room inn and restaurant owned by sanctuary founder Dr. John Pastore and his wife, Marilyn. The area is also home to miles of hiking, biking and cross country ski trails as well as Burke Mountain Ski Area. Tours of the Sanctuary are currently available by appointment only. We offer tours for individuals, small groups, families and school groups. Always call first, (802) 626-9924, to set up an appointment for a tour. We suggest a donation of $5 per adult, up to a total of $50 for a larger group for a tour of 30-45 minutes. 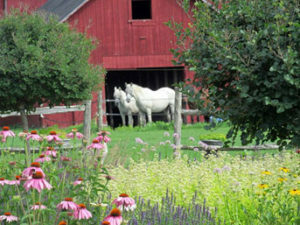 Following the tour, you are welcome to walk the grounds and visit with the animals. At MVFAS, we seek to change people’s perceptions about farm animals by offering them the chance to meet the animals face to face. 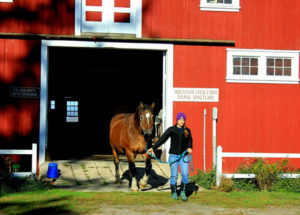 Educational programs include special tours for school children focusing on educating young people about the suffering of farm animals in factory farms and zoos, as well as, the opportunity to witness the residents experiencing the joys of freedom unique to a sanctuary environment. Follow I-93 N to I-91 N. Take Exit 23 at Lyndonville. Follow Rte. 5 North through the town of Lyndonville to Route 114. Bear right onto Route 114 and follow for 4.4 miles. Turn left at the Burke Hollow sign, bearing left to go straight up the hill. At top of the hill, turn left onto Darling Hill Road. The entrance to the Sanctuary (and the Inn) is immediately on the right. Take I-91 N to Exit 23 in Lyndonville. Refer to directions above. Take Autoroute 10 E to 55 S to I-91 S to Exit 23. Refer to directions above.